I’m Baaaaack. Tons of work was accomplished these past two weeks. Most of the unhoarding is done around here too. Except the garage, but that doesn’t count as the house right? Every cupboard, box, bag, closet, drawer and room are cleaned out. I admit it was all fear driven. Fear of not having enough time with school on top of the rest of my life, plus too many scary episodes of Hoarders. I painted my daughter’s room blue as well. She loves it and I’m so glad, because I don’t want to do it again for another decade! Or longer. Finally, today was my first day back at the University of Idaho after twelve long years. There were a sacred few moments for me this morning riding my bike in the rain and walking through my old campus. I’ve often felt if those walls could talk they’d have some pretty neat stories to tell. As far as recipes go I’m sorry to admit it, but meals these past two weeks haven’t been very interesting. Lots of pb&j sandwiches, hot dogs, salads and ordering in. 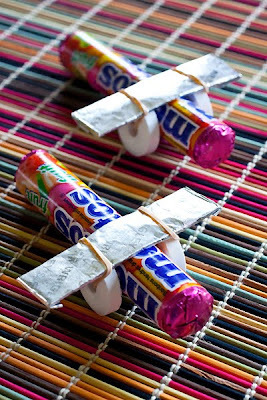 All I have to offer are these candy airplanes I made for my daughter’s last day of class. We come from a family of pilots and my mother made a version of candy planes with Lifesavers I adored as a child. Clara loves them now and they’re something she can pass on to her own children. Later on. Much much later on. These fun treats are as much a part of our family as growing up around the actual planes themselves. 1. If the gum is too soft the wings will bend. Take all sticks of gum out of their packages (leave them in their foil though) a few days ahead of time and set aside to dry out. 2. Run a rubber band through two individual Lifesavers. Stick a candy roll between the wheels and place a stick of gum on top for wings. Wrap each side of the rubber band up around the wings. This takes a little practice, but you’ll get it quickly. Aw! Those are too cute! I want to make some for the girls group I lead at church. They would love them! Morgan that's a great idea. These are adorable! They'll be great for preschool functions and birthdays! I'm glad to hear you accomplished everything you set out to! I can barely half clean my room...maybe you can send some motivation my way? These are adorable! These are the cutest ever. I am in cleaning mode too. I have a few days off and I am cleaning the house, getting rid of stuff that I do not use, even if I think I do. I am pretty much nesting, LOL getting ready for Emma. Oh don't remind me. It's time for summer purging, but our camping trip has tripled my cleaning work load! My son got a smarties airplane one Halloween from a classmate. Super cute! This is sooooooooo cool! I have my 2 nieces visiting in a month so I needed these ideas!!!! I'm going to send you a photo when I'm done! Thanks! Tooooooooo cute! Congrats on going back to school--I'm so proud of you and know you'll do great! Such a cute idea, I so have to do this for my niece!